Renewable energy is on the rise in Canada. Communities big and small are harnessing Canada's windy weather conditions to power their communities thereby reducing their dependence on fossil fuels. According to The Canadian Wind Energy Association "more wind energy has been built in Canada between 2006 and 2016 than any other form of electricity generation," accounting for about 6% of Canada's electricity and generating enough power for almost 3.2 million homes. In December 2016, the village of Baddeck in Victoria County proudly joined the ranks of wind energy producing communities. Located in the heart of Cape Breton, Baddeck is the birthplace of Canadian Aviation and home to the Cabot Trail and the Alexander Graham Bell National Historic Site. It has a population of 826 residents and a very active tourism industry. A place known for celebrating history and traditional Gaelic music, Baddeck is gladly embracing the new technology. Their 1.7 Megawatt wind turbine built along the 105 TransCanada highway has been in operation for almost a year. At it's highest point, the turbine installed by Dartmouth-based company ScotianWinds, stands at 145 metres tall, as tall as a 36 storey office building. All of the energy generated by the turbine is connected directly to the local power grid and is therefore consumed locally. Prior to its installation, a meteorological tower was installed to measure wind speed and determine whether or not it was a good location for the wind turbine. ScotianWinds also held 2 information sessions in which local citizens were invited to attend and voice questions or concerns. 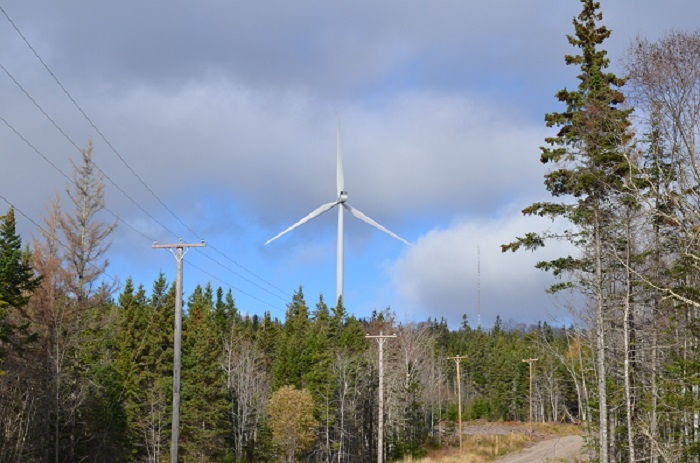 When asked how many residences and businesses in Baddeck are powered by the wind turbine, President and CEO of ScotianWinds Terry Norman said that "at full capacity of 1.7 MW we can provide power to meet all of the needs of 650 homes." The Baddeck Community Wind Project was carried out under the Community Feed-In Tariff Program (COMFIT) introduced by the Government of Nova Scotia. The Energy Department of Nova Scotia website reads "COMFIT is the world's first feed-in tariff for locally-based renewable energy projects. A "feed-in tariff" (FIT) is a rate per kilowatt hour that small-scale energy producers are guaranteed for a fixed period of time." The COMFIT program makes it easier for small communities and First Nations alike to invest in wind power. It also relies on community ownership based on investments from a minimum of 25 local investors which keeps profits in the community. Power generated by the wind turbine offsets 5 900 tonnes of CO2 annually. According to ScotianWinds, "after a few short months, the turbine has generated as much electricity as it takes to build, install, and decommission it." In addition to gaining energy independence and reducing overall greenhouse gas emissions through the use of wind, the windmill has the added benefit of the tax revenue it generates for Victoria County. Terry Norman said that represents $9, 681 for this year alone. Bruce J. Morrison, Warden for the Municipality of the County of Victoria said "[he thinks] it fits well with the community because it is clean and green. That's the first one in Victoria County and we have ideal conditions [for wind power] in North America. I would say it's been quite well received in the community. With this, you're investing in the community. With the infrastructure and the construction work I would say the company made an effort to go local." Another benefit that comes from the Baddeck Community Windmill is the 1% community dividend that Scotian Winds donates to the community. Scotian Winds estimates that for a project of this size 1% gross revenue would represent roughly $8 000 annually. The funds are controlled by a Community Liaison Committee (CLC) made up of local citizens and community group representatives. Norman said ScotianWinds would be setting up a meeting in Baddeck at the end of November to find people interested in being involved. There are twelve CLC's across the province, one for every community windmill project. The CLC's are open to anyone and will decide by consensus where the money will be invested within the community. Unlike other wind farms, the Baddeck wind turbine is not equipped with a storage battery and so it cannot store excess energy on days where there is a lot of wind but low demand for electricity. That means on days where there isn't so much wind or demand for electricity is higher than usual, rather than using stored up wind energy, the power must come from other sources. In October maintenance operators for the wind turbine had to replace the hydraulic motor which meant that only about half of the potential power could be produced for that month. Because of that Terry Norman said "it does not look like we will achieve our plan for our Baddeck turbine in 2017 due to the shut downs we have faced. Our year to date number as of October 31st is $5,700. Our revised estimate is that the Baddeck Community Dividend for 2017 will be about $7,000 if the turbine operates normally for the next two months." He went on to say that "most turbines are very dependable. Once we have resolved the issues related to our Baddeck turbine, it should be available at least 98% of the time when the wind is blowing. However, if the wind is too strong (i.e. more than 72 km per hour) then the turbine will automatically shut down for safety reasons. Once the wind drops below 72 km per hour, then it will start again." Bruce Morrison said that "based on our experience we would certainly recommend it, just keep in mind the location and to consult the community." He also highlighted the interest of local investors as an indicator of the overall acceptance of the technology. When asked what he would say to other communities considering wind power, Terry Norman said "I highly recommend they pursue it. We need to move to 100% renewable energy as soon as possible. Today 33% of the energy consumed by Nova Scotians is coming from renewable energy and 27% is from wind energy. Norman added that "renewable energy projects can be excellent sources of revenue for First Nations."